I know, I’m on a cherry kick lately…..but summer and cherries go so well together! 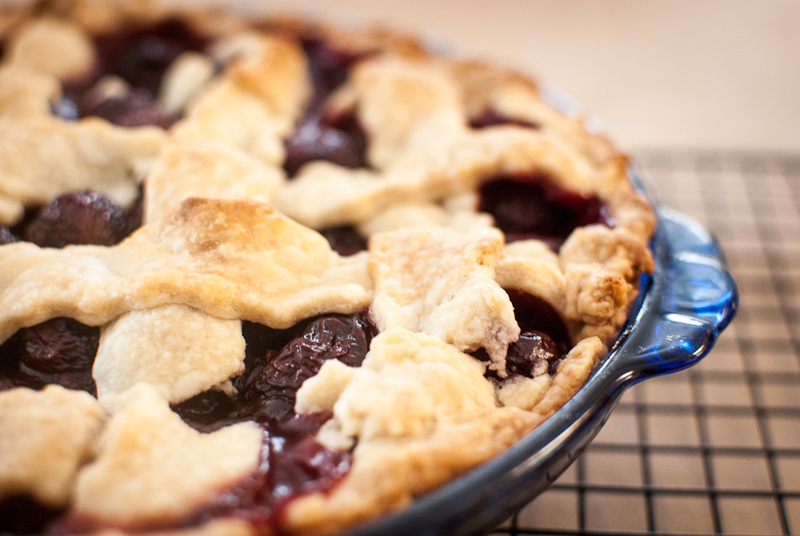 The classic buttery lattice topped cherry pie is on every baker’s list in the summer months. This was my very first lattice topped cherry pie! I’ve always wanted to make one, but they looked sooooo hard…. So this summer, was my cherry pie summer! It wasn’t until recently, and I mean real recent, that I started to loooove cherries! When I was little, we had a cherry tree in my back yard and one summer I overdosed on cherries! It wasn’t pretty, and I hated the taste of cherries ever since that summer. Cherry everything…candy, medicine, anything cherry. Funny it took 25 years later to taste the fresh summer cherry again and fall in love with this fruit. I paced myself this summer…..I really did! Let’s not repeat child hood horrors! The crust was surprisingly easy to do. 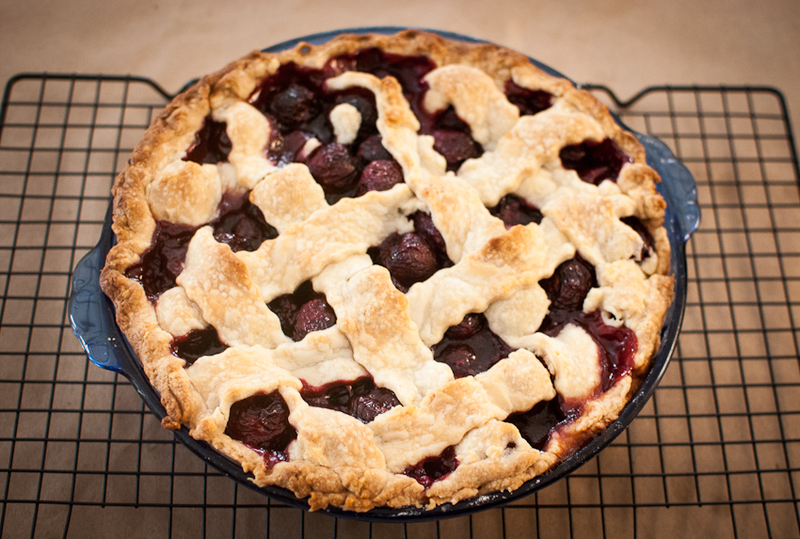 I’ve made a zillion pies before, but never a lattice topped pie…I know… funny! I always say the trick to a flaky buttery crust is cold ingredients. Very cold, and chill before rolling and chill after rolling before filling and baking. It really makes all the difference in a great crust and a mediocre crust. The cherries…. I like to use bing cherries. Big red cherries. I bought a cherry pitter after making cherry hand pies that took forever to pit! It is so worth the small investment, even if you only use it twice a year. I found one for $15 at my local grocery store…it has this neat bin on the bottom to catch all the pits. 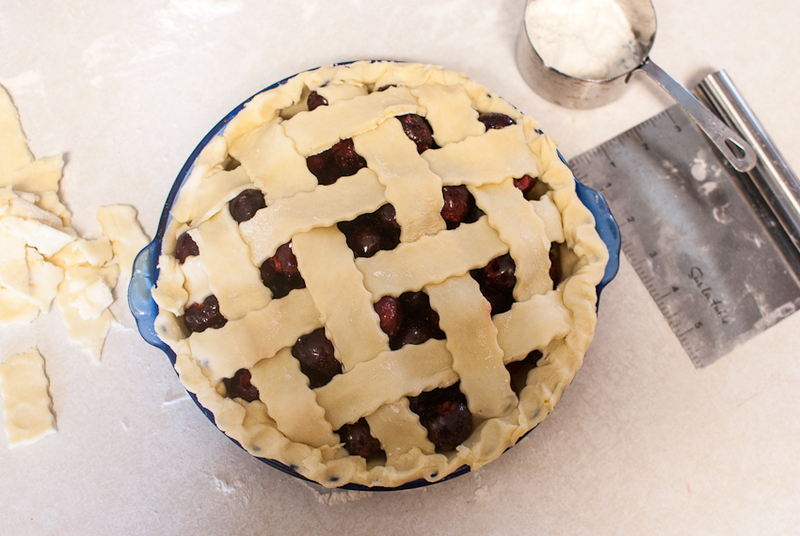 I think it took me 15 minutes to pit all the cherries used in this pie! Major time saver!! 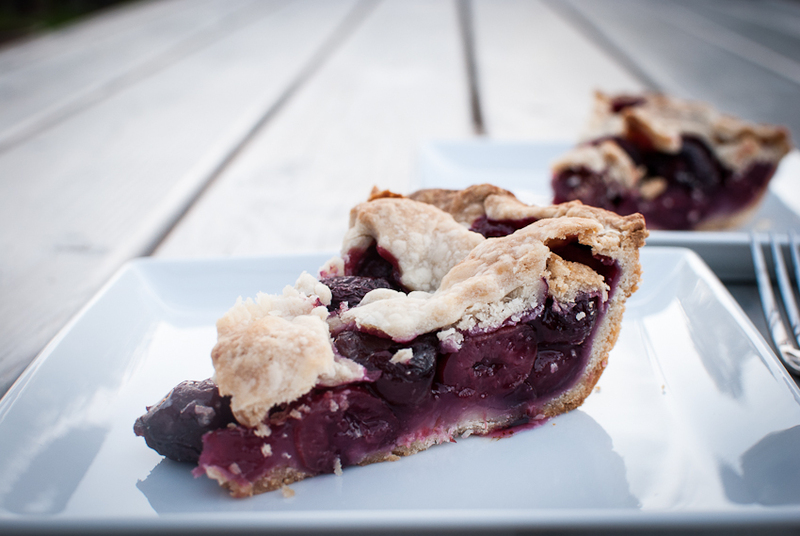 Don’t let your summer pass by without making this classic cherry pie. 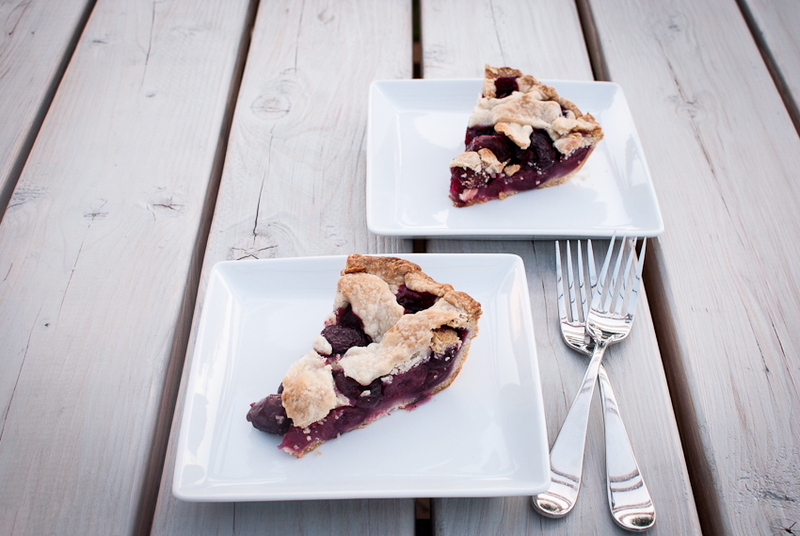 Invite a friend or two over and eat pie, just because it’s summer! Toss cherries with sugar, then stir in the almond extract and lemon juice. Once cherries have released some of their juices, add the cornstarch and salt, mix. Roll out one disk of chilled pie dough on a floured surface. Place rolled out dough in a 9 inch pie dish. Fill with cherry filling. Roll out second disc of dough and cut into 1 inch strips. Place lattice dough on top alternating strips, one under the other. Chill pie for 30 minutes before baking. Bake at 350 degrees for 50-60 minutes, until golden brown and filling is bubbly. In a food processor, pulse the flour, salt, and sugar until combined. Add the chilled butter, pulse until crumbly. While pulsing on low, slowly add the ice water and lemon juice, just until mixed. Form dough into two discs, and wrap in plastic wrap. You had me at “all butter”. Yum!